The European Commission estimates that nearly three quarters of a trillion Euros will need to be spent on nuclear power over the next decades to enable it to maintain a market share of about one-fifth of the EU electricity mix in 2050. At the same time it notes that the cost of building new nuclear plants has risen 50% in the last decade. Critics say the Commission is too optimistic and has not analysed what the advent of renewables and changing electricity market mean for nuclear power. The cost of building a new nuclear plant in Europe is about 50% more than nearly a decade ago and rising, confirms the European Commission in a new policy paper on nuclear investments. Yet it expects a substantial nuclear new-build programme worth €350-500 billion to maintain 95-105 GW of nuclear in Europe in the long-term. That would correspond to an electricity market share of 17-21% in 2050, down from 27% (120 GW) today. The Commission also estimates that €50 billion will need to be invested in lifetime extensions and another €250 billion spent on decommissioning and waste disposal out to 2050, for nuclear to play its part in the energy mix. These are the headline figures from the “PINC” or “Communication for a Nuclear Illustrative Programme” that was released by the Commission in Brussels on 4 April. Despite it being the current Commission’s first attempt to describe the future of nuclear power, there was no press conference, just a quiet, off-the-record technical briefing for journalists. The policy paper as a whole closely resembles a draft version that Energy Post got the scoop on in early February. The overall message is clear: nuclear is getting more expensive. The cost of new-build today is 47% higher than in 2008, when the last PINC was produced, a European Commission source said. As we reported back in February, there is a “historical trend of cost escalation”, reports the Commission in the PINC. Reactors have got bigger, driving up construction times, and new safety standards impose new costs. Source: PINC. LTO = long-term operation, which means operation beyond an established time frame, e.g. of the existing licence. “As we have tended to see in earlier editions of this paper, it paints a very optimistic view of the sector,” says Antony Froggatt, who works on energy policy at Exeter University and Chatham House in the UK. He is one of the authors of the annual World Nuclear Industry Status report, which is critical of the industry. Froggatt points out that the average new-build cost projections used by the Commission to calculate its €350-€500 billon investment range are below real-world cost projections today, even the projections in the PINC itself. Thus, the Commission uses estimates of €3807-€5379/kWe in “overnight construction costs” for different reactors, but at the same time recognises that Hinkley Point C in the UK is expected to cost €6755 per kWe. (See pages 11-12 of the PINC.) Flamanville in France is also off the scale (€6287/kWe) and every other reactor under construction is at the upper end of it. What could be interpreted as an effort at realism is the Commission’s decision to opt for the low end of its €350-500 billion investment estimate for new-build out to 2050 in its political communication. It now talks about €350-450 billion for 95 GW rather than €450-500 billion for 105 GW as it did in the leaked draft. It includes a stark warning that “these investments will depend of the evolution of the market environment and on the ability of the industry to reduce costs, with current constructions such as Flamanville and Olkiluoto experiencing significant delays and cost overruns that undermines the competitiveness of the EU nuclear power industry”. In contrast to the Commission’s caution, Foratom, representing the European nuclear industry, believes that the EU should plan to spend some €500-800 billion on at least 100 new reactors out to 2050.
Who will build all these reactors and where? Traditional builders such as EDF are in dire straits, with unfinished projects and financial troubles. 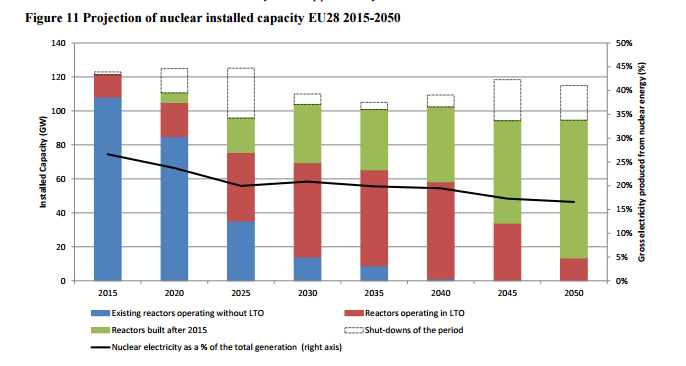 Yet the Commission expects some 2-3 new reactors a year from now to 2050. The current build rate is more like 2-3 a decade. There are just 4 reactors under construction (in Finland, France and two in Slovakia) and another 7 planned, including 2 at Hinkley point C in the UK. But Jean-Pol Poncelet, Director General at Foratom, is optimistic: “We did it in the past and even more than 2 or 3 a year,” says. “In the 70s and 80s we built more than 150 reactors across Europe.” He continues: I do not think there are industrial hurdles as such. What we miss is a [political] vision.” In the PINC, Poncelet expected the Commission to take a stronger stance on the future of nuclear power in the low-carbon economy. “We were expecting targets”. Instead, the Commission “just refers to figures provided by member states”. Although the PINC notes that “evolution of the market environment” is crucial to the business case for new nuclear, it does not explore what this means in practice. The PINC does not address market design and the effect of a growing share of renewables because these issues are dealt with under other parts of the Energy Union, explained a Commission source. The problem is that the more renewables, the fewer hours nuclear plants will run and the more expensive they become. 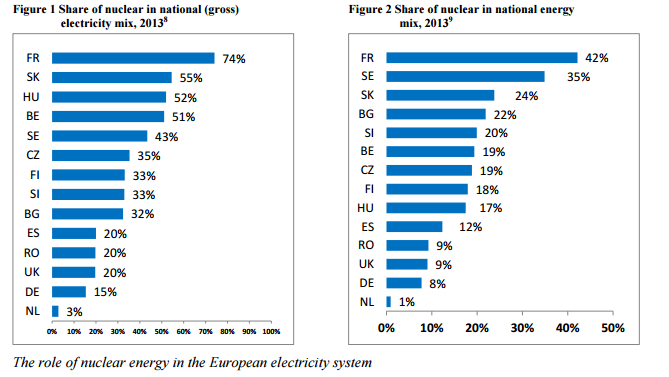 Nuclear is a provider of baseload power and there is less and less of that in Europe. There will be no more baseload at all in Germany in 2030, says Dimitri Pescia from the German think tank Agora Energiewende. Instead, there will be days where the whole load is covered by wind and solar PV. He is unsure about whether and how the Commission has accounted for this effect of renewables on the business case for nuclear. “We would have expected their view on the market,” concurs Poncelet. “Are we really evolving towards something without any baseload? Nuclear is high capex, like renewables. We need to know where we are going.” Froggat wonders: “How does nuclear at 20% fit with renewables at 60 or 70%?” He anticipates the need for a lot of storage. Pescia argues that today’s electricity market with its very low prices makes neither new nuclear nor lifetime extensions a viable commercial proposition. He expects that France, where half of Europe’s nuclear fleet is, will propose Contracts for Difference (the UK public support model), capacity payments or long-term contracts of some sort, for both. In the PINC, the Commission expects France and the UK together to account for about two-thirds of the 80 GW of new-build it expects to be added by 2050. France’s €55-billion “Grand Carenage” programme is to upgrade its existing 58-reactor fleet. Note that the PINC does assume that France will see through its objective to reduce the contribution of nuclear to power production to 50% by 2025 (down from 75% today). Pescia believes that nuclear operators will need support. “Pro-nuclear parties were always very careful because asking for support would completely break the idea that nuclear is competitive, but I really do not see any other choice,” he says. One alternative would be a carbon price that dramatically pushes up the electricity price, but no one expects the EU Emission Trading Scheme (ETS) to deliver that any time soon. “Lifetime extensions are the cheapest way to produce electricity,” says Poncelet. Maybe so, but they still need tens of billions in upfront investment. The €55-billion EDF estimate for France suggests that the PINC’s €50-billion estimate for the whole of Europe is on the low side, to say the least. Most experts think it unlikely that plants would be kept open for longer specifically to raise more money for end-of-life extensions. Yet if lifetime extensions do not materialise, will nuclear operators be able to plug the current gap in decommissioning and waste disposal funds? Normally these funds are accumulated throughout a plant’s natural lifetime. The problem revealed by the PINC is that nuclear plants are 64% of the way through their lives, but have only amassed 52% of the funds needed to pay for decommissioning and disposal. “There is a huge problem of missing money especially for decommissioning and waste management,” says Green MEP Claude Turmes. The Commission puts the gap at €120 billion out to 2050. The Greens believe it is at least twice as big. A Commission source admits that decommissioning estimates are higher than they were in 2008, when the last PINC was produced. It is noteworthy that Germany, which is the only European country with actual experience of decommissioning, has one of the highest estimated costs at €1.1 billion per unit (vs. €300 million per unit for France for example). In Germany, this debate is very much alive right now. The big question is whether utilities will be able to honour their nuclear end-of-life commitments when they are financially so badly off. But for state aid expert Maria Kleis at ClientEarth, a group of activist environmental lawyers, the PINC itself is the problem. “It says we will have nuclear for a long time to come. DG Competition can use this – and the Euratom Treaty – to argue that nuclear power is a common EU objective.” This would render it eligible for state aid. She explains that only if the EU explicitly opposes something is it banned from state aid. In all other cases, the proposed aid will be evaluated on the grounds of whether it is necessary, proportional etc. Despite all the issues it raises, this is the first PINC to include any estimate at all of decommissioning and waste disposal costs. “We do not claim these are the final figures,” emphasised a Commission source. The Commission will strive to collect more data from member states on both investments and costs in future. But it stopped short of promising to verify everything it gets. It is also the first PINC with an explicit focus on safety. This is further justification for introducing the decommissioning and waste disposal figures. “The absence of sufficient post-closure funds is a safety issue because if there’s no money, the necessary measures [for safe decommissioning and waste disposal] cannot be paid for,” points out Johnston. A Commission source said that nuclear liability, introduced as a priority for EU action by previous EU energy commissioner Günther Oettinger, has been put on the backburner. “We prefer for the moment to focus on safety” he said by way of explanation. Wrong. Plenty of nuclear projects in South Korea, China and other places are coming in at one-third the price of recent EU new builds. Nuclear power plants can – and are – being built cheap. False. It is renewables which need storage. Nuclear does not need storage. No. The big question is when German politicians will take responsibility for destroying the electricity market in Germany, which is financially killing *all* electricity suppliers – even renewable energy suppliers. No. It is the *renewables* which have a high system cost. Without the renewables on the grid, the total system cost of nuclear is lower even than the cost of coal power. That is why nuclear-powered France traditionally exports electricity to coal-powered Germany and it’s other neighbours. Renewables are distorting the market and increasing the system cost of electricity, not nuclear. I’ll leave the rest of this gish-gallop of confusing antinuclear misinformation for others to comments on. Joris, your response confirms to me that you are an ideological supporter of nuclear energy. When you see something that you regard as critical of nuclear power, you jump on it, but you are not open to any kind of criticism. First of all in what sense is the article misleading? You may think some of the claims by nuclear critics are misleading, that doesn’t make the article misleading. Your first remark is irrelevant to the article. This discusses the PINC report, which is about Europe. Why not follow the link and look at the PINC report and you will see that the costs of all reactors in Europe is at the upper end of the scale. It’s not about South Korea. You say it’s false to state that nuclear needs a lot of storage, but nobody says that. A system with a lot of renewables and not much nuclear needs a lot of storage, that’s what it says. Etc. You don’t seem to be able to simply read what the text says. I can assure that I am an ideological supporter of maths and physics only, nothing else. Not fossil fuels. Not nuclear, and not renewables. The point is that a system with a lot of renewable needs a lot of storage. Period. The article clearly attempts to link nuclear to a supposed need for storage, while it is only renewables which need storage. I call this misleading. South Korea is certainly relevant for the estimation of future nuclear power costs, because South Korea is a very good example of a developed, democratic country similar to most European countries, but where nuclear has been built in a well-disciplined and steady manner. This is why South Korea has managed to benefit from learning-effects and has managed to keep reducing the cost of nuclear power. Europe is a far, far larger energy market than South Korea, so it is logical to assume that Europe could obtain the same financial performance of it’s future fleet of new nuclear power plants. Sure, the first few dozen nuclear power plants built in Europe – after decades of stagnation – will be expensive. But ultimately at least 100 plants will be built, and perhaps as many as 500 will be built in this century. So it’s reasonable to look at the long term prospects, not just the start-up situation. Could you explain why you believe that the South Korean experience is irrelevant to a discussion of the long-term viability of a large new European nuclear build program? What is so discouraging about discussions like this is that you are not reading what the article says, you are reading what you think it says. But the article is only referring to reactors in Europe, it is only referring to the reactors mentioned in the PINC report. So the article is Correct. If you had just said: sure, this may be the case in Europe, but not in other countries, you would have been right. By the way I don’t know where you got the idea that 500 nuclear reactors will be built this century in Europe? If I read you correctly that is what you are saying. Where do you live? Let me guess: not in Europe! Fair enough. I’m sorry my comment was discouraging. I’ll have to do better. For reasons of brevity, I suppose I am omitting some nuance. Here’s some further explanation. In this sentence, Froggatt is referring to “real world cost projections” outside the PNC report. Surely, such real-world projections should include the projections of nuclear costs in countries like China and South Korea. South Korea – as mentioned – succeeded in keeping nuclear costs low throughout it’s nuclear expansion. But China, more importantly, is exemplary because it is currently the only country engaged in a serious nuclear build program similar to what France did 40 years ago. China came from pretty much zero nuclear only a short time ago, like France did at the time. Hence, China has lessons on nuclear construction costs which are worth learning. As it happens, China has succeeded in rapidly reducing cost as its nuclear program is developing. They are now already projecting nuclear costs below $2000/kW. (note for example the cost figures for the 6GW Yangjiang nuclear base which is under construction and projected to cost less than $12 billion. And this is gen III technology, similar to the European EPR in terms of safety and performance. These are real-world projections which EU citizens might like to know more about, but they learn nothing of this in this article. That is a shame in my opinion. It is a shame because the IPCC in it’s most recent report recommends a quadrupling of nuclear power capacity globally in order to save the climate. That recommendation applied to Europe yields my rough figure of 500 NPP’s across Europe by the end of the century. P.S. You called me an ideologue, and perhaps I do sound like one, but the real ideologue here is Mr. Antony Froggatt, mentioned in the article. He’s an ex-Greenpeace antinuclear campaign leader. This was not mentioned in the article, but readers might like to know this kind of information, I would say. Joris your belligerence is what gets me. Your criticism of Froggatt’s quote is well taken – you should have said that in the first place. The article states clearly he is a nuclear critic. We do not ask for the complete biographies of everybody we talk to. I have no idea about the backgrounds of the other people interviewed. Or your background for that matter. You have not gotten back to me on the 500 nuclear power stations that will be built in Europe this century. But let’s not tire our readers any further. I leave you the last word. 1- China produces many industrial goods much cheaper than we in the EU can. A typical example is the ~45% import tax that the EU charges for PV-panels produced in China, in order to prevent that our PV-panel industry is reduced to zero. 2- There is no good cost-price accounting system for big projects such as NPP’s, under the Chinese communist system. It’s a political decision so numbers are adapted such that they support the political decision. 3- In the past year wind production alone surpassed that of nuclear greatly in China. Wind was nowhere a decade ago, while nuclear flourished at that time. Nuclear then also had approved huge expansion plans. However with 5yrs plan adaptations, nuclear expansion plans became less while those of wind increased. Recently also solar expansion plans were further increased, so solar production may also surpass that of nuclear (I estimate at ~2020). – Chinese government also concluded that nuclear is extremely expensive. – Chinese prices are impossible to reach for us in the EU. Note that nuclear generates only ~3% of China’s electricity. It implies that nuclear is in China as insignificant as nuclear in Netherlands. No. China is doubling down on nuclear. Because nuclear is cheap and clean. We can reach Chinese prices for nuclear again. We have reached them in the past. In France, Sweden, Belgium, South Korea and the USA. That was 40 years ago. We will reach those low prices again. Because we need to save the climate and as the IPCC has recommended we should quadruple nuclear power. Besides, even the high-priced plants built today – like Hinkley Point C and Olkiluoto – are more cost-effective than renewables and storage. They will deliver power much cheaper than power in Germany. That’s why the UK and Finland are both continuing their nuclear power programs, despite temporary setbacks in the past. We should be thankful that they are continuing, for the sake of our common future and our children. Nuclear plants constructed 40years ago were very dangerous as shown by various incidents, accidents and disasters. Prices increased (also in France) when safety levels requirements were raised after TMI, etc. As you know, the reason for the pause in new nuclear build was to allow an assessment of the aftereffects of Fukushima. So 6 gigawatts of nuclear made nearly ninety percent as much power as 50.5 GW of wind and solar. The Netherlands should be ashamed that a country so threatened by sea level rise gets only 3 percent of its electricity from reliable carbon-free power. Compare and contrast: The cost of building on-shore wind in Europe is about 50% less than nearly a decade ago and with the arrival of new IEC Class 3 turbines (with higher capacity factors) is likely to lead to further falls in the cost of energy. There is a “historical trend of cost reduction” etc etc.. i.e. the exact reverse of nuclear. Ditto PV. The 50% is true as is the IEC Class 3. Euro500m buys you around 625GW of on-shore @ Euro0.8million/MW (this of course raises issues – where to put it all). With a capacity factor of 30% you get 200GW. I use this to illustrate that on current pricing nuclear does not look like a good financial deal. Add to this the fact that the German pop’ wants to see nuclear gone, the Italian pop’ voted against it, Sweden (closing) and so on and so forth. So where would this 100GW go? With respect to finance, I notice that good wind projects in Germany can get debt financing of 0.5 to 1.5% (source: my KfW contacts). I understand that new nuclear in Europe has financing costs of 8%? (well that is what they claim for Hinkley). Hmm, could it be that new nukes are seen as a financially higher risk than wind? “In the 70s and 80s we built more than 150 reactors across Europe.” I know the guy that was on the original French team that brought back to France the Westinghouse designed and “Frenchified it”. He thought the design was old fashioned even then – his view of Flammenville – “an antique”. Something like power to gas could provide buffering to nuclear or renewables. But the problem is that P2G wants/needs low cost electricity & as the article shows, nuclear will struggle to do this & right now will struggle to compete with even off-shore wind (Denmark – circa Euro74/MWh). Which ever way you look at it – nuclear looks very very expensive compared to other options. From an industrial perspective: which companies are globally successful in (for example) wind?- hmm that’s a hard one: Vestas, Siemens, Gamesa, & others – lots of Euro companies. & for nuclear? that would be Areva? who is now being bailed out. Please step forward those who want to invest in nuclear – come on – hands up….. what! no takers. Oh dear. If you want to see where the future is with respect to power generation, go where the money is – hint – it ain’t in nuclear. Further hint: invest in winners, not losers. What is the cost per kWh of a wind-powered, zero-carbon electricity grid which can power the EU even when there is no wind? I think you are trying to hide a dirty little secret. The secret is that a wind-power dominated grid relies on fossil fuels for at least 50% of the total power delivered. Wind and solar energy are fuel saving devices. They reduce – but do not and cannot eliminate – the consumption of fossil fuels. Wind power and solar power are transition technologies. They reduce the emissions of existing fossil fueled power plants somewhat, but they cannot replace them. The financing cost of nuclear is high because it is a long-term investment which is at continual risk of political interference. Just look at Germany. It’s market price for wholesale electricity is so low due to renewables subsidisation that *every* supplier of electricity is going bankrupt. Everybody except the subsidised renewables of course. The financing cost of wind power is low because governments guarantee the investor a subsidised profit throughout the (short) economic life of the plant. Neither does nuclear as it’s base load. Also shown by France which is now reducing the share of nuclear towards 50%. Both need additional renewable technologies, such as storage, hydro, etc. Nuclear power is baseload power. Are you saying that’s a disadvantage? The load varies greatly so flexible generation is needed. A combination of ff, hydro, etc. is used to solve the variation. However; that need becomes less and less with the increasing overcapacity of wind+solar (Germany consumes on av. 70GW, wind+solar capacity is now 85GW increasing with >5GW/a. Scenario’s schedule >250GW in 2050). So the % of the time wind+solar produce enough will increase as even small wind or little sun will then be enough. As the marginal costs of wind+solar are near zero, it’s then beneficial to use the overproduction for the production of gas (hence the many MW-scale P2G pilots in Germany), which then can be stored cheaply in earth cavities or used to fuel cars, etc. The stored renewable gas can be used to fill the winter gap in wind+solar production. So in the end no fossil fuel needed. Same is not feasible with nuclear because the marginal costs of nuclear power is rather high (~2.5cnt/KWh). Another issue is that NPP’s can and do stop sometimes within a few second. So a 1GW NPP needs 1GW spinning reserve with 1GW grid connections to the customers of that 1GW NPP. That spinning reserve is usually fossil fuel power plants as NPP’s are far more expensive for such role. Hence even a running NPP causes continuous CO2 emissions. As wind+solar consists of millions of small generators distributed all over the country whose production is accurately predicted hours & days in advance (with the weather predictions), wind+solar need only a very small spinning reserve, a few percent of the capacity. Which implies far less CO2. “Another issue is that NPP’s can and do stop sometimes within a few second. If you have 50 NPP’s, then at any one time only a few – if any – will be offline due to an unscheduled outtage. So spinning reserve is needed to cover just a fraction of the total nuclear capacity. Your claim that 100% reserve is needed for nuclear (1GW for 1 GW), is flat wrong. Wind and solar *do* in fact require 100% backup. Not only that, but that backup will operate on a daily basis and produce the majority of the electricity of the system. P.S. Don’t you recognize my name Bas? I’ve discussed these things with you many times throughout the last few years on various websites. You keep making the same mistakes, and I keep correcting them. Remember? Your idea implies that all NPP’s have to operate below max. capacity, which is more expensive. So fossil fuel plants are used as spinning reserve, emitting extra CO2. Several studies researched CO2 emissions of nuclear. This review shows that a good estimate for nuclear’s emissions is 66 gCO2/kWh. Though it should be raised*). You can’t blame the wholesale power price (due to overbuilding of fossil fuel plants) : Hinkley Point is supposed to sell at better conditions than renewable (higher tariff independent from the wholesale market and increasing over time) and it is still unable to attract investors. Pretty easy to be a “winner” when the govt. literally mandates the use of your product (renewable portfolio standards, not to mention feed in tariffs, etc…). I’m skeptical that the (“auction”) prices being quoted truly represent unsubsidized cost. If renewables are so competitive, why do they continue to demand (and receive) large subsidies? And mandates. Put your money where your mouth is. Finally, there is the fact that cost is not the only issue. Intermittent power is only capable of providing a minority of overall power generation. When you add the large scale storage (not to mention grid costs) that will be required for significant market penetration, the overall costs of the renewable approach go far higher, probably higher than nuclear. Perhaps that is the real reason for continued large subsidies and mandates (despite the low per kW-hr costs being quoted). One thing is true, though. Nuclear does need to put all its focus on finding ways to reduce costs. (Excessive regulations and requirements are the problem.) That should be their main focus, as opposed to trying to get subsidies to “forgive” their relentlessly increasing costs. That said, there is no justification for treating nuclear any differently, under policy, than renewables. Nuclear and renewables should receive similar subsidies (if any) and all mandates should include nuclear and renewables. Better yet, remove all subsidies and mandates, put a price on CO2 emissions (and the emissions of other, health-harming pollutants) and let the market decide how to respond. Surely you (and other renewables boosters and nuclear critics) would be willing to sign up for such fair, even handed policies, right? What are you afraid of? If renewables are indeed cheaper, no nuclear will be built anyway. “Put your money where your mouth is”.. erm I will be (together with Gas Natural Fenosa – 300MW on-shore wind pipeline – Spain – no subsidies at all & GoodEnergy UK – a smaller 30MW project – no subsidies). With respect to storage – all sorts of solutions out there – I have written articles in this respect on Energy Post. Otherwise I have no problems with your later comments – tech neutral, carbon taxes (ETS does not work) let the best tech win – trust on this – it won’t be nuclear. Wind and natural gas can be competitive, but it remains co2 intensive since the natural gas will supply >50% of the power. You can’t save the climate if you use fossil fuels to back up wind power, but you can make a lot of money. Wind power is the natural gas industry’s best friend. But it’s not a friend of the climate and that’s a problem. Only nuclear power plants can replace fossil fuel power plants. Plenty of assertions there Mr Van Dorp but no back up. “Wind and natural gas can be competitive” erm with what? I found the >50% “interesting” – begging the question – based on what? BTW; the spanish bunch are using small hydro to buffer their wind. Wind paired with natural gas can be competitive with 100% natural gas. But that’s because the cost of the fuel saved by the natural gas plant is just about enough (outside the USA) to pay for the wind power plant. In other words: wind power can be an economical way to save natural gas. That’s great! But it’s not good enough to save the climate. To save the climate, it’s not good enough to merely save some natural gas. To save the climate, we need to *replace* fossil fuel burning entirely, particularly coal! Not just when the wind blows. Not just when the sun shines. And not just when some government somewhere decides to subsidize wind and solar for a few years. None of that is good enough. I truly wish it was. To save the climate, clean energy has to be cheap. Cheaper than coal, and as reliable as coal. Wind and solar can help save some natural gas, some of the time. But only nuclear can replace all coal, all of the time. I’m fine with wind and solar, and I’m fine with people who advocate for wind and solar. In fact, in my day job I actually engineer and commission solar PV systems fairly regularly. I’m working on a system right now, a few hundred kW for a new Dutch university building which will be ‘energy neutral’. But I can’t abide with attacks on nuclear power. I can’t allow the promotion of solar or wind energy at the cost of nuclear power. Losing wind and solar wouldn’t matter to solving climate change. But losing nuclear power basically means the climate is toast, guaranteed. For me (and others) that is unacceptable. Hence, I feel compelled – as do many other people – to push back against antinuclear propaganda whenever I run into it. That doesn’t fit at all with reality. – gas decreased from 15% in 2010 towards 10% in 2025. The contrast is even stronger as wind+solar increased from 8% in 2010 towards 21% in 2015, while electricity produced by gas decreased from 89TWh/a towards 60TWh/a. If there is no wind, during the night or on a cloudy day, fossil fuels provide the power. 100% of it. On an annual basis, the percentage fossil fuel is >50%. Germany can try to break the laws of economics by using subsidies and creative accounting, but Germany cannot the laws of physics. Windturbines cannot provide power when there is no wind. Germany exists in the same universe as the rest of us. 1. Because nuclear cannot up-/down regulate with short delay / fast (due to a.o. the steam generators) other (running) generators are always needed to compensate for sudden failures of nuclear power plants. And those unexpected failures occur frequently, many times more often than with airliners., etc. I assume that that is one of the reasons France didn’t increase nuclear share above ~75% and is now decreasing it towards 50% in 2030.
the right mix of renewable can deliver 100% of all electricity needed. In Germany the auctioned price is the only ‘subsidy’. – Investment €31billion for 3GW net generation (90% CF). Less tangible major subsidies such as liability limitations, etc. (IMO ~5cnt/KWh) were not quantified. It’s safe to conclude that wind+solar+storage expansion would explode, if they get similar high subsidies as nuclear. As more solar and wind is added, eventually they will be totally subsidised. Even Agora – the official German energy think tank – now acknowledges that wind and solar will eventually depend for 100% on subsidy. Permanently. E.g: Feed-in-Tariffs (FiTs) for solar were ~50cnt/KWh until 2008. Now ~10cnt/KWh. Whole sale prices decreased from 6cnt/KWh to 3cnt/KWh. Far less than the FiTs. Agora study expects for solar a cost price of 2-3cnt/KWh in 2050 in Germany. So another decrease of 7cnt/KWh while the av. whole sale price won’t decrease more than 2cnt/KWh. So scenario study show that the Energiewende levy will begin a long decrease after 2023. The whole sale price will bottom out as a.o. P2G plants become then profitable. Hence the many MW-scale P2G pilot plants in Germany. Research shows that the efficiency of those plants may increase substantially, which implies that the whole sale price may bottom out at an higher level. Can you show a link which confirms this? As indications show the opposite! Before 2007 FiT’s subsidized 90% of PV-solar (FiT 50cnt/KWh, whole sale market price ~5cnt/hr). Now FIT’s subsidize 70% of PV-solar (FiT 10cnt/KWh, market price 3cnt/KWh. In 2050 new PV-solar: ~3cnt/KWh, av. whole sale price ~2cnt/Kwh. So the subsidy then <40%. In 2050 at least 40% of wind & solar is older than 20yrs, so won't get any subsidy. So the overall subsidy level concerning wind & solar will then be 3cnt/KWh. Costs improvements are likely, as those plants are destined for mass production (unmanned, housed in easy to transport containers). 2. The costs of batteries decrease further (now ~10%/a). Sorry, the third paragraph from below, which starts with, “In 2050 at least 40% of wind … “, is wrong. In 2050 at least 40% of wind & solar is older than 20yrs, so won’t get any subsidy. So the overall subsidy level concerning wind & solar will then be 20%. 1. Efficiency & cost improvements of P2G plants may continue. Which implies big expansion of P2G, hence the whole sale price may recover. Agora states that renewables destroy their own market, causing electricity price collapse, and requiring the development of new ways of subsidising renewables. If the price of electricity goes to zero whenever the sun comes up or the wind starts blowing – which is what Germany is heading for – nobody will invest in wind or solar. Hence, investment in wind and solar will eventually be totally financed through subsidy. You assert that the subsidies will fall off and disappear in Germany. Agora says the complete opposite. I don’t see a link which contradicts my statements? The interview answer of Pescia, which you quote, shows ideas in a discussion to improve the market. Agora scenario study show that the Energiewende levy is expected to start a long decline after 2023. Nuclear power costs are not locked in stone, in South Korea each reactor is cheaper than the last, defying inflation. Management is key, its not that nuclear power is inherently expensive. you may assume that less strict safety regulations & surveillance play a role in S.Korea. Hi Karel, nice even keeled comments to Joris. Bit of a disconnect when this article says renewables are cheap – yet no where do they survive without subsidies. In Germany, cuts to subsidies mean Germany will reach ‘peak wind’ in 2019 – so it does not seem renewables will be cost competitive by then. Where exactly is non-hydro renewables cost-competitive? Assuming you count also the subsidies that nuclear get, it’s clear that new wind+solar+storage (P2G+battery) is already cheaper than new nuclear. Just check the unsubsidized costs of Hinkley, the only recent NPP whose costs were checked by really independent (EU) accountants. – Wind at the great plains ~3cnt/Kwh. As the costs of wind & solar are widely expected to decrease further in next decades, you may expect more places will follow. Wind and solar needs the ability to sell at a fixed price something which is prevented by the organized power market which prevent power producers to sell directly to clients. So between them either you have an organized power market based on fixed price where fossil fuel can’t compete because they have variable cost or a power market based on variable price where renewables can’t compete because they have fixed cost. In both cases you need to compensate the player who is prevented its fair access. The power market in NW-EU countries is free. Which implies that producers are free to sell their electricity directly or indirectly to clients, or to sell directly or indirectly at the power Exchange or to any other legal body. Indirectly; e.g. when it are small producers, it’s often beneficial to use intermediates. It caused the development of virtual power plants. Those are often cooperation’s with a coordinating & administrating intermediate. Of course producers or buyers have to request and hire transport capacity at the grid operating companies. Those are monopolies under strict control, so they handle every request as equal as possible given technical & economic feasibility. There is only one constraint in Germany (and some other countries): Transport requests for renewable generated electricity are prioritized. Though this has limited practical influence as the producer first has to find a buyer, and in general the grid has enough capacity to transport towards the buyer. If not, the grid is expanded as with the interconnection between NL and Germany. The capacity of that interconnection will be doubled in 2017 as the Dutch bought more electricity in Germany than could be transported by the existing interconnection. The increase is partly caused by the lower German power prices, partly by the much higher UK and Belgian power prices. So part of the imported electricity is transferred to UK and Belgium. I am not talking about access to the production market, I am talking about access to consumption market. Currently the only consumers who can deal a PPA with a wind developpers are corporate buyers and not even in every countries. For example Google can make a PPA at a fixed price with a renewable developper for its finish datacenter but is unable to buy directly wind power in Netherland which makes them needs to go through Eneco. As you states consumers are prevented to choose their power plants and developers are prevented to sell directly to the consumer. They both need to go through an intermediate which makes the market a monopsony for renewable energy sellers. As these intermediates are always conglomerates who also develop power plants projects thanks to high administrative barriers, they are in a position to prevent sellers from accessing the final consumer. So in order to have a level playing field you need either to be able to protect renewable developers from the dumping of large producers, change the rules of the organised market so it’s no longer dictates by how much is produced on the grid (it’s not working anyway to help balance the grid) or be able to allow them a fair access to consumers without intermediates. Sorry that I wasn’t clear enough. Access to the consumer market is of course also free (of course also bound by reasonable technical rules). Living in NL as a consumer I can select one from ~20 utilities to deliver me electricity. I switch roughly once in 3years, mostly because the new one is cheaper. I have my 4th utility now (3yrs contract). As consumer I can make a PPA with an utility to deliver only wind generated electricity. ‘vandenbron’ and ‘Greenchoice’ are two utilities specialized in that type of electricity. They deliver everywhere in NL. Nowadays many classic utilities also developed 100% renewable proposals, as consumer unions may them exclude otherwise from their auctions which they keep for their members in order to get cheap prices (bigger purchase volume = more discount). Eneco delivers also 100% renewable. Of course Google is free to buy at one of the others. Though it may be that Google’s datacenter requires so much electricity that only few providers are capable to deliver. But then they can choose more providers. I would do that anyway for security of supply reasons. Sorry but both statements are not correct. Anybody who can deliver with reasonable security can sell directly to consumers. As selling to consumers require specific organization (also IT-systems, etc) not all power producers do that. There are utilities selling to consumers, who don’t have any generation facility. They buy all via bilateral contracts, the power Exchange, etc. Sorry, but that is nonsense as the upcoming of many small utilities who also sell to consumers shows. That is no longer true. Also thanks to the auctions of consumer unions. I now pay less than with my previous PPA, etc. Building their own grid is nonsense as the grid is not owned or operated by competing utilities. In NL the grid is operated by a 100% state owned grid company (Tennet, which also runs big part the German grid) & municipal owned companies for the distribution grid. Access to the grid is guaranteed equal for everybody. Sorry but wind & solar can and do offer for lower prices than classic power plants as their marginal costs are lower. So the large producers with those classic power plants complain, because they are competed off the market (hence Vattenfal wants to close coal plants, etc). You can and must only deliver electricity to the grid for which you can show that you have a contract with a buyer. Otherwise the grid would become an unmangeable mesh. This option (fair access to consumers) is reality here and in Germany. Once again I am not talking about having your consumers allowed to be serviced by the grid in exchange of having your power production sent to the grid. I am talking about a consumer buying power from a producer by paying a transportation fee to the grid. That’s subtle but there is a huge difference. Large power producer complains about renewable are fake. Remove renewables and there will still be an oversupply of production because they overbuilt power plant thinking the demand would go up while it’s actually going down (and grid reinforcement did not help either). It’s just an excuse to make renewable work with a market where dices are loaded against them. That’s why I say you can only remove the support of a technology if you have a market where this technology is able to compete in a level playing field. And if you remove this support while keeping the same power market we have, storage and private grid will become the only way to make renewables. We already have plenty of closed distribution system in Europe. When you say that building your own grid is nonsense because the grid is public that’s like saying that having companies delivering packages is non sense because we have a public postal service or that deploying a mobile phone network or optical fibers is non sense because we have a landline public phone network, and so on and so forth. Truth is : electricity is now 30 €/MWh on the production market while this 30 €/MWh electriciy translates into a 90 to 250 €/MWh electricity bill for the consumer… When you’re talking about MW sized plant, the network needed is actually quite cheap compared to what you can earn. So why is the German government refusing to let unprofitable coal plants close, and pressuring the Swedish government to have Vattenfall keep mining lignite in eastern Germany, when they’ve announced they want to stop? Because they know that if the lights go out, they’re dog tucker. Bringing in a uranium fuel tax, after the carbon tax actually did its job and skewed the market towards nuclear, and spending billions on power lines which only benefit wind, are further examples of how far from a ‘ free market ‘ it is. Do you have a reliable link which shows that German government refused Vattenfall to stop and pressurized Swedish government? Government (dena) can simply refuse Vattenfals request to stop if it endangers electricity supply, etc. If dena refuses, they have to compensate Vattenfall for all further losses, etc. It’s all regulated. So, I estimate that Vattenfall will be happy with a refusal. – because the negotiations with the unions about a good redundancy and financial compensation scheme (1 – 2 months salary for each year the employee worked at the company, re-education cost compensation, etc.) may take many months or longer. Note that an independent daughter of Vattenfall runs the local grid of Berlin. Thanks to promises Vattenfall just got the majority vote at the referendum and can continue. If they don’t handle the closure in a social way, big chance they loose that activity with a next referendum. Etc. Germany is a social democracy according the Rhineland model, which differs from the Anglo-Saxon model in USA & UK. *) E.g. Dutch house owners union organizes common electricity purchase auctions for its members. So German government did not refuse the closure. Which I can imagine as then other unprofitable plants are entitled to similar compensations. Your FT link states: “…cabinet is due to meet next week to discuss mothballing some coal-fired power stations”. Gabriel had meetings with employees & unions of the plants/mines to be closed. I can imagine that he, a socialist, had to do something. So he promised to write a letter against official (so also his) German policy. Also shown by his statement in the letter:“would be important to me personally”. Of course he knew the letter wouldn’t work out (it was published! ), but he can show that he did his utmost. This humorous YouTube shows his attitude. “Last year, German electricity production from lignite or brown coal … reached its highest level since 1990”. 250billion € will buy you ~800GW of baseload wind power much earlier than 2050. Any new nuclear plant will be economically dead before it even goes critical. Britain is testing 500m kitepower starting next year. We are going to deploy 3ct/kWh offshore wind before 2030. Even without advanced next gen wind power nuclear is screwed. Investors know so what is the EU going to do? Shell out all the money together with similar blind governments? KitGen is an interesting idea. Hope you will succeed! However you should be fast with developments as the decreasing prices and increasing capacity factors of classic wind turbines may supersede KiteGen. This nice wind overview by accountants may help you. Realize that the stated prices are from 2013/2014, so to high. This report about the Morocco auction (~€2.8cnt/KWh) shows that wind prices continue to fall. The virtue of high altitude wind is that you are pretty site independent. I don’t think 70-90% CF and a material reduction by 90% to reach EROEI between 350-4000 is even possible with conventional wind. It’s 500m+ wind after all we are exploiting. Realize that your projected 3cnt/KWh in 2030, may not be competitive at that time! 30€/MWh is the projection for 2016 KiteGen Stem technlogy. Advanced high altitude wind machines (carousel in GW sphere) in 2030 might run cheaper than 10€/MWh. It should be quite obvious that huge material savings plus very high CF results in cost savings. We now have mastered the technology, this would not have been possible 5 years ago due to technology restraints. People like Joris should understand the advantages if he really understands physics like he claimed above. This is the cheapest of all technologies with the least environmental impact/highest EROEI. Public acceptance should also be higher than with wind turbines. The kites are almost invisible from ground at over 500m,no shadow, no noise. I don’t know as much about physics as Joris but I know a bit about using wind, from twenty years flying hang gliders ( including as a full time job ), plus a bit of experience with sailplanes and paragliders. Kitegen’s website claims that their kites will be more efficient than a standard wind turbine because they’re always moving into undisturbed air. They don’t talk about the aerodynamic differences between the working airfoils. Their kite is more like a basic paraglider, which might get a lift- drag ratio of eight to one. The blade of a wind turbine is built using exactly the same construction techniques as a sailplane’s wing, with an l/d over forty to one, but also a much greater speed range. The torque of the windmill rotor is transferred directly to the generator by a rigid coupling, whereas the kite does so with a 500 metre floppy, draggy cable. Rotary motion is inherently more efficient than reciprocating -bikes have pedals, not pulleys -and I’m very dubious about the practicality of Kitegen’s carousel design. If the drag kites are 500m high, they’re presumably about the same radius or more out from the hub, which puts pretty challenging limits on the rotation rate for a very unstreamlined wing. Wind turbines have radii on the order of 100 metres, and have to keep the tip speed below the speed of sound. Kitegen would have over a 500 metre radius, a messy ‘tip’, and a floppy ‘spoke’. If it couldn’t generate high power through a high rotation rate, it would have to do it through high torque, which means heavy duty line and wings. Heavy duty = heavy. The video online of a Kitegen launch shows the trees in the background thrashing around in about twenty knots. Kitegen offered to power a Sardinian smelter for 5,000 hours a year – out of 8,760. How do they get their heavy fabric back up into that sweet air after all those calm spells? And with one up, how do they launch the rest on the same pivot? If they’re using a carousel, how do they get the upwind kites around at the same speed as the downwind ones on the other side? Renewables enthusiasts sneer at new generation nuclear as vapourware, but at least some physical examples of them have generated megawatts of power for cumulative years apiece ( fusion hasn’t, that’s still vapourware in my book. ) Things like Makani and Kitegen make cool simulated videos, but they don’t have enough airtime for a novice rating. KiteGen is flying and refining the Kitewing (a more rigid power wing, not compareable with paragliders) since 2014. Thousands of simulation houres are backed up by hundreds of hours field testing. The 3D pattern flight program of the carousel is amazing but hard to explain. Even the upwind kites are almost always generating lift. Forces per Kite are controlled by deploying hundreds of kites. The carousel is the next step, it only exists in simulation but there is nothing on the physics or hardware/software side that would prohibit building it (unlike fusion). The fifth generation KiteGen Stem prototype which was tested with several power wings is at TRL8 now. You can visit the pilot plant on demonstration days but there is no video or actuall data released on the internet at this point. The real world tests are the basis of the Spain scenario in the link above though and the Stem has been demonstrated to utilities which realize the potential. The Scottish test site will have a permanent permit to fly at up to 500m. I don’t understand your bysicle analogy? The physics of wings, ropes, drag, weight,…are well understood, simulated and tested. The Stem is nothing new but only a new way of combining parts and learning to control them. There is also Ampyx which uses ground based generators but a solid airplane wing. Makanin is generating on the wing. Google should have gone the other way. There are about 20 groups developing ground based high altitude wind systems at the moment. KiteGen and it’s involvement with several European universities is the source of that. I don’t know of any US based group other than NASA following that path. – rotary motion ( ie a turbine ) is more efficient than reciprocating, especially if power is only delivered in one direction, and the return stroke loses energy. It also causes more wear, and makes a messy electric waveform that needs to be rectified. Oh dear, no one will pay that amount of money for nuclear when renewables plus storage already is much cheaper when you look at all the costs. Why would anyone choose nuclear with all of its huge problems ranging from vast hidden subsidies to potential catastrophies and thousands and thousands of year of toxic waste storage when you can have a decentralised reliable renewable energy grid that offers the far better deal?